The design for this quilt comes from a mid 1880’s Australian quilt made by Margery Harvey of Oberon NSW which is now owned by her great great grand daughter Jan Smith. The quilt is quite frail and over the years it appears to have been trimmed on one side. Margery and her husband Edmund had a family of 11 children, 6 daughters and 5 sons. Two other quilts made by Margery have been found and all have similar shapes in the design. The original quilt was made by hand. This version has a little hand piecing and one round has embroidery added or it could be changed to appliqué if preferred but the majority of the piecing is machine pieced. Completed in the Medallion style this quilt comes together easily and will give you your own version of a truly historic quilt. The sample quilt is made in many shades of blue but can be made in reproduction fabrics, soft shades or bright fabrics. A colouring in page is included with the requirement list for experimentation. The pattern also has a photo of the original quilt and 4 completed colourways. Lessa Siegele is a first class Quilting teacher. She has been teaching since the 70’s and was recently featured on Alex Anderson & Ricky Tims’ The Quilt Show. 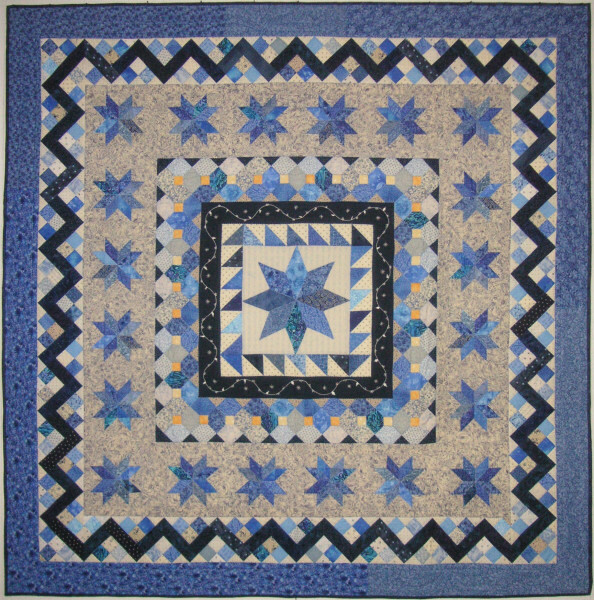 Her reproduction of the famous Australian Rajah quilt is TQS’s 2016 block of the month.